Bigeye Tuna hold the ticket for deep sea fishing. This species of Tuna spends more time in deeper waters than any other. While this species closely resembles its relative the Yellowfin Tuna, the Bigeye Tuna has a different color variation, grows to a larger size, and, as its name suggests, has a larger eye. Description: The back of the Bigeye Tuna is a deep metallic blue, which stretches down the sides of the body as well. The belly is a whitish color, and its side bands are blue, which also help to distinguish it from the Yellowfin Tuna, which has yellow bands. This fish is also noted by absence of vertical dotted bands of brighter white stretching upwards from its underbelly. Size: The most common weight for a Bigeye Tuna is around 80 lbs; however, a fish can far exceed this weight as it continues to mature, and has been recorded at weights up to 500 lbs. The reddish meat and high oil content of the Bigeye Tuna make it an excellent catch for grilling and broiling. Location: While this large fish is found Gulf-wide, it typically stays in deeper, offshore waters. 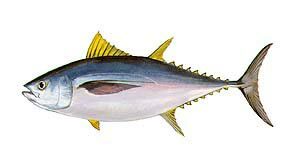 Because the Bigeye Tuna feeds during both the day and night, it is a common fish to hook when trolling in deep sea waters, regardless of what time it is. Though it can grow to an extremely large fish, the Bigeye Tuna prefers to eat small, live bait at lower depths. 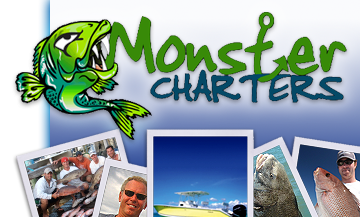 Pick up your line and contact Monster Charters to reel in the perfect Bigeye Tuna excursion.